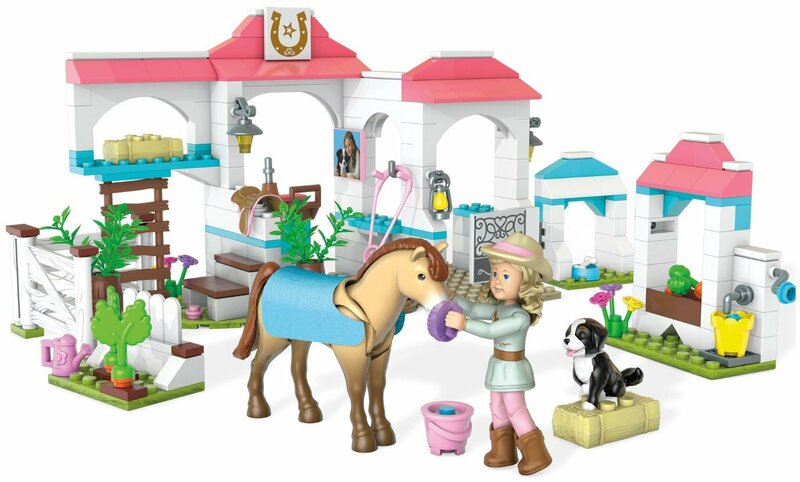 Nicki's Horse Stables- Nicki truly appreciates the great outdoors, and now youcan too with Nicki's Horse Stables by Mega Bloks American Girl! Build thestables and the horse jump so Nicki can take her horse Jackson for a ride. Youcan also help Nicki tend to her chores at Twilight Ranch when you brushJackson's coat, or pick carrots for him to snack on. And keep watch on Nicki'sdog Sprocket! He loves jumping through the swinging stable doors - he's such agood boy! Sit Nicki on Jackson, and have them all go on a fantastic equestrianadventure! Ideal for ages 8 years and older.